A tropical fruit indiginous to Asia. It is one of the most known fruits in the world. Besides fibers and many minerals, the fruit is rich in vitamins A, C and E.
Rich colored, usually yellow, and firm when ripe. Food complements: Complements any dish, Particularly savory dishes. Choosing: Look for the tropical strong sweet and fruity aroma. Unripe mangoes have, however, less or no scent. A fresh mango will give slightly to the touch but avoid those that are very soft or bruised. Buying: Any fruit market, grocery store or supermarket. s ripeness. Strong sweet aroma means it is ripe. Procuring: Mango fruit takes 3-6 months to ripen. The ripe fruit may vary both in size and colour. Cultivars are variously yellow, orange, red or green and carry a single flat, oblong pit that can be fibrous or hairy on the surface. Mango is generally sweet although the taste and texture of the flesh may vary. Mangoes are consumed both as ripe fruit and as an unripe fruit. In unripe, pickled, or cooked forms, the mango skin is consumed comfortably. Ripe fruits on the other hand, the skin is thicker and bitter and is usually not eaten. 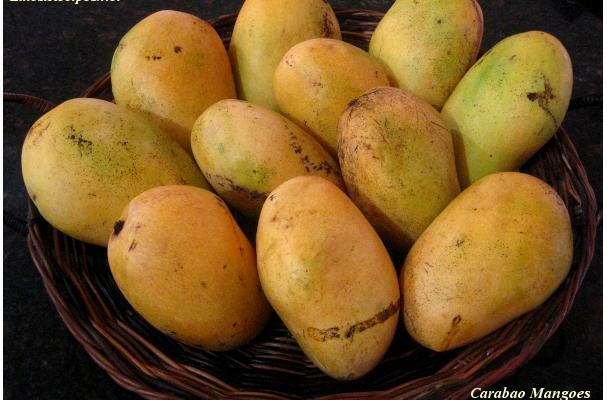 Ripe mango is commonly eaten fresh. Mango is extensively used for food, juice, flavor, fragrance and color. Cleaning: Cut fresh ripe mangoes lengthwise, along the pit. It can be peeled from the flash with a small, sharp knife. You can then dice the fruit for sauces or serve as raw. If you wish to cube the fresh mango, cut the fruit cheeks without peeling, then score flesh into squares cutting to, but not through the skin. Then push the mango cheek inside out, pushing fruit cubes up and apart. Cut chunks from the skin to serve. One large mango should yield about 1 cup of diced mango. Keep unripe mangoes at room temperature to ripen, which may take up to a week. A paper bag might help them ripen sooner but they will not ripen at temperatures below 55 degrees F. Ripe mangoes can be kept in the refrigerator for up to 2 weeks, ort they can be frozen, dried, cooked in syrup or pureed. Mango is the national fruit of India, Pakistan, Bangladesh and the Philippines. In Hinduism, perfectly ripe mango serves as a symbol of attainment. Mango blossoms are also used when worshipping the Goddess Saraswati. History: English word 'mango' came from the Portuguese 'manga', which is derived from the Tamil 'manga' or mānkāy, from mān "mango tree" + kāy "fruit". Thought to be native to India, mangoes have been cultivated for more than 4,000 years. The tree is related to the pistachio and cashew.